We all have ideas running through our heads. We imagine how great it would be for our ideas to come to fruition so that we could live out our dreams. While it can be fun to think about our successful idea, it is even better when you put forth the actions to make your ideas become a reality. This is where many people stop when it comes to their ideas. They are afraid of pursuing them because they do not want to experience failure. It’s more important to them to avoid experiencing great disappointment than experiencing great success. They engage in classic loss-avoidance tactics by wishful thinking and inaction. The truth is, sadly enough, that they do not want to make their ideas a reality bad enough. They are content with idealisation, visualisation, and daydreams. Unfortunately, they are only doing a disservice to themselves and their ideas by doing this. When you have a great idea in your head that is worth pursuing, you need to follow through on making that idea a reality. There are many people in this world today who are full of regret and resentment because they never pursued their ideas. They hate the fact that they wasted their lives and let opportunities pass them by. You do not want to be one of those people. No matter how big your idea may be, do not let it slip away because you believe it is not achievable. The products and services you use today were created by people who pursued their ideas — no matter how audacious they seemed. You must possess the same mindset when it comes to your ideas. If you want to see your ideas become a reality, you will need an effective strategy to help you accomplish your goal. 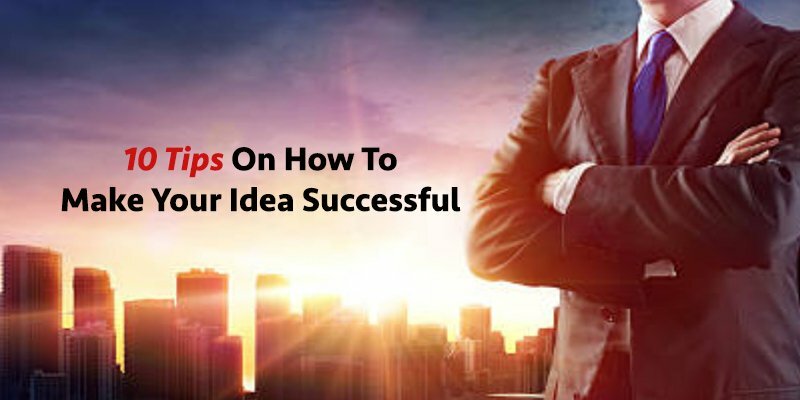 We now present to you 10 tips that will prove effective in helping your idea become a reality. Continue reading if you would like to learn how this can be achieved. You must be supremely confident in yourself if you want to accomplish anything. There will be many people who will cast doubt upon you because they possess the fears, loss-avoiding and risk-averse characteristics of the average person. You cannot allow their limitations to become your own limitations. When you do this you are allowing others to control your thinking and behaviors, instead of being the one who governs yourself. Michael Jordan was cut from his high school basketball team and eventually became arguably the greatest basketball player ever. Steve Jobs was fired from Apple and came back years later to completely take over and transform the company. The reason they went on to create success in their lives is because they truly believed in the visions within their minds. They were confident enough not to let setbacks discourage their self-belief. If you do not believe that you can accomplish your goals, you will easily give up when things do not go as planned. Possessing unwavering confidence is what helps you keep going when the world seems to be against your idea. Ideas not written down remain dreams in your head. When you write your ideas down, you begin the process of making them come to fruition. This is because you start to write down actions and create strategies that will help your idea become a reality. If you ask any successful person how they achieved their goals, they will tell you they did so by writing them down. Always write it down and put it in a prominent place as a reminder to yourself. Practicing this behavior will make you become more focused on achieving your ideas. This is because you see them every day, are reminded of them every day and start to become obsessed with them. You are now forced to take action, instead of just procrastinating and letting the pursuit of your idea fade away. The path towards success is one that has a lot of bumpy moments. What you planned for is not always what you get. Instead of being stubborn and stuck to your original plan, you will need to be able to pivot and pursue new courses of action. This is why you need to make sure that you create a plan that can be implemented when your original idea starts to fall apart. Both Instagram and Snapchat were not the original plans for their founders. They chose to pursue different routes when it was determined that their target market had different preferences. Making these choices is what allowed them to produce the success they experience today. This is why you can never associate going with a different plan as a failure. Failure is when you keep doing the same futile thing over and over again hoping for better results. Successful thinking is when you understand that you have to do something different if you want different results. Although you have big ideas, you need to make sure that you are pursuing something that has a real and practical chance at succeeding. This pragmatic exercise may be difficult to undertake when there are seemingly so many inventions and innovative business models which were untested, unrealistic and even ridiculed when they first entered the market and yet became runaway successes. Still, you will need to be realistic with yourself and the idea you seek to execute. The question whether you have the capital, connections, and resources to make you’re a reality. If not, hold off for a minute until you have fulfilled at least one of these three requirements. You do not want to waste your time chasing dreams that may never materialize. There are 2 important things you have to achieve when crafting your product or service offer. First, you need to ensure it actually provides value to the customer – in their daily lives, in their business, their holidays, their medical needs, etc. Without value, you will not gain the validation of the marketplace in terms of sales. Second, you need to ensure that the value you provide is unique so that you differentiate yourself from your competitors, your brand identity is bolstered by a different identity and your customers find it easy and natural to remember and relate to your business, brand, products and culture. Make sure that your offerings stand out in the marketplace and you will have a better crack at success. No one achieves success on their own. You will need the help of others who possess the skills and connections that you do not have. You cannot do everything by yourself. There are so many different pieces that go into making an idea work. You will need to focus on what you are best at and let others focus on their core competencies. The art of delegation helps you accomplish more at a quicker pace. Trying to do everything on your own will only leave you frustrated because you are not making any progress. Even if you do make progress, it will be far slower than the rest of your competitors. Just because you believe you have a brilliant idea, it does not mean that your assumptions are correct. You need to research whether your idea is feasible, whether anyone has a similar idea currently in the marketplace, and whether there is a real demand for your idea. Doing this will help you determine if you are making the right choice in moving forward with the pursuit of your idea. You will also need to find the information that informs you how to make your idea successful. This helps to cut your learning curve in half so that you reduce the mistakes you will make along the way. You will need to possess a lot of passion for your idea, especially at the very beginning of getting it off the ground. This is when times will be the hardest because few people support your idea and it seems like it is taking forever for your efforts to start gaining traction. When you are not experiencing results to keep you going, you will have to depend on the passion you have for your idea. The passion you possess is what will keep you motivated when all else seems to be failing. You have to be very optimistic when you are working to bring your ideas to fruition. If you have any negative thinking going on it will start to dominate your thoughts. This will cause you to sabotage your own idea because you are constantly thinking about what is the worst that could happen, instead of focusing on producing the best outcome. If you are focused on positivity you will produce positive results. You do not want to be blinded by your own biased opinion. You may think that you have the best idea introduced to mankind, while other people question what could you possibly be so confident about. Sometimes you will need to bring reality back into your mind by remembering that your thoughts mean nothing. You are working to provide a product or services for other people. If they are not enthusiastic about your idea, then you have a problem. Ask them questions about what should be changed and why these changes should be made. This will help you gain a better understanding of how to serve other people, rather than serving your own ego. At the end of the day, whether your ideas sink or swim depends on effective execution. Follow the tips outlined above to gain that extra edge in bringing your ideas to fruition and living the life of your dreams. With a complete range of accounting, tax, immigration & compliance-related services, AsiaBiz is your trusted one-stop solution.